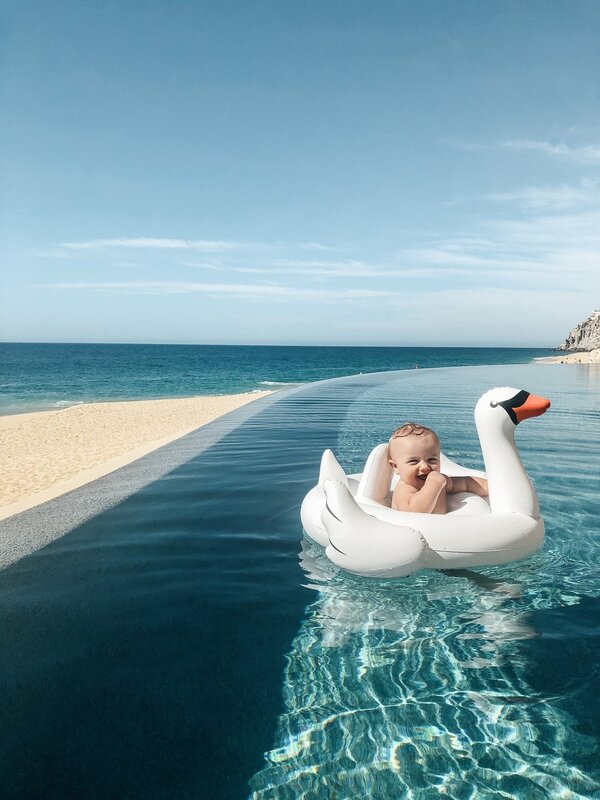 Our absolutely FAVORITE spot to travel is Cabo San Lucas. A little back story, Jay and I started dating in high school, we're High School sweethearts. My senior year of High School I was fortunate enough to tag along with his family on their Spring Break Vacation. Fast forward two years later, Sophomore year of College, we got engaged in Cabo! 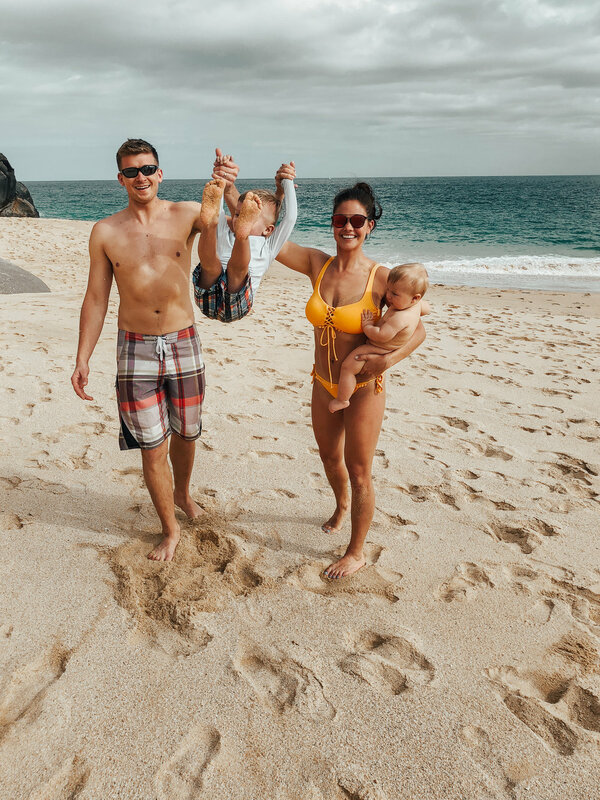 A few more years went by, and our spring break spot turned into a true family vacation spot where we now bring our two little munchkins with us. 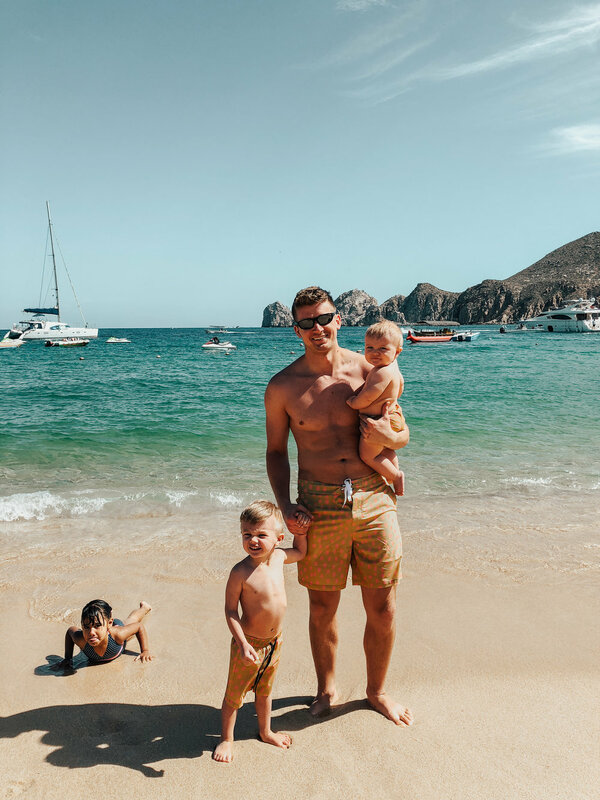 Going almost every year with Jay's family has been such a blessing and I think it's safe to say that we LOVE Cabo. Let me tell you a few reasons why we recommend it! First of all, the Resort that we stay at is impeccable, absolutely stunning and will make you never want to leave again. It's called the Grand Sol Mar , it's the closest resort to "Lands End" and you can actually walk/hike those beautiful mountains seen in a lot of my pictures to the infamous Lover's Beach, which gets its name from the two seas coming together (Sea of Cortez and the Pacific Ocean). If you aren't feeling like a hike, you can also get here by water taxi which is also very fun especially for the kiddos as the taxi drivers usually scope out fish for them to look at in their glass bottom boats. There are a number of top Resorts you can stay at, it just depends on how close you want to be to all the night life and restaurants, how much you want to pay, and the accommodations you get. Other places I would recommend staying at or have known other people to really enjoy would be Playa Grande, Hacienda Beach Club, or ME Cabo by Melia. Also, note I am not a trip advisor lol so these are merely from my personal experiences or recommendations by others! If you are staying near all the restaurants and night life, then it isn't necessary to rent a vehicle because you can walk everywhere; which is what we do since the Grand Sol Mar is so close to everything! Even if you are staying further out a resort, it is very easy to catch a taxi and it's usually pretty cheap ($2-3/person). If you choose to rent a vehicle it may be hard to find parking when you get to where you're going, as the streets are narrow and crowded. NOTE: when riding in a taxi, they do not have carseats so you usually just hold on to your children for the less than 5 minute car ride, which may be a reason why you want your own car! When I go on a beach vacation, my idea of that is simply laying on the beach or by the pool drinking cocktails or mock-tails and soaking up all the sun because in Minnesota it's still usually cold when we go. However, there are a lot of activities for you to enjoy while you stay in Cabo! Dinner reservations are usually a must especially if you are going during the "high time" spring break months! Places we LOVE below. Alcaravea – Italian, smaller portions, smaller restaurant, and absolutely delicious. We went here twice! Romeo & Juliets- Italian, very popular place for people to go. Restaurant is very cute and has outside area without roof! Lorenzo’s – located in the marina, Oysters and Lobster, usually looks busy so must be good! Nicksan – Sushi, amazing sushi, slightly on the spendy side! Maria Corona – Authentic Mexican, amazing food, great diablo shrimp. Also have show each night with singing and dancing! The Office – located on Modano beach, tables and chairs are set up on the beach. Seafood and mexican. Great show at night! Hacienda Cocina y Cantina – Mexican, located in a beautiful resort. Food is good! Maria Jimenez – Mexican – Suppose to be amazing authentic mexican. Restaurant Pancho’s – Mexican, Seafood is a great place for breakfast or dinner. Mi Casa - Mexican, amazing carnitas!